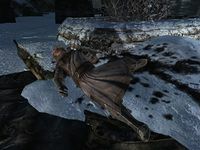 Tolan is a Nord member of the Vigil of Stendarr. After the destruction of the Hall of the Vigilant, he will come to Fort Dawnguard to seek protection. 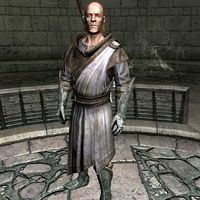 You will encounter him arguing with Isran about the recent vampire assaults when you first enter the fort. When Isran sends you to Dimhollow Crypt, Tolan will arrive there ahead of you, where he will be killed by the vampires in the first room. He wears apprentice robes of Restoration, along with a pair of steel plate gauntlets, a pair of steel plate boots, as well as an amulet of Stendarr. He is equipped with a warhammer imbued with a leveled enchantment, a torch, and a potion of cure disease. This page was last modified on 29 July 2017, at 00:29.